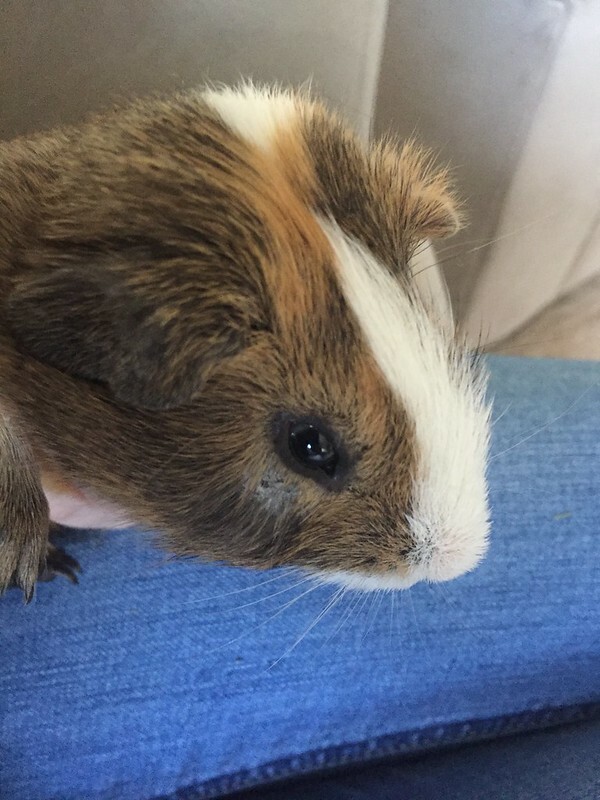 I am a new Guinea pig owner and new to this thread. I just got him 3-4 weeks ago. He has scratches and hair missing under both eyes, and it looks maybe like ringworm (based on google pics). I took him to the vet two days ago and she just gave us 2 antibiotics, an anti-inflammatory oral medicine and some eye drops. He won't stop scratching the marks though and it was bleeding earlier. What should I do? I can't afford to keep going to the vet it's $56 a visit plus the medicine. I'm really worried about him though and I don't know if I should take him back and request ringworm medicine? Please help! All advice welcome! It's not likely to be ringworm around his eyes. It could be a fungus, of which ringworm is just one, but ringworm has a classic "ring" appearance. Which antibiotics were you given? What is the strength of each, and the dosage of each? And what are the eye drops? The eye drops are ofloxacin ophthalmic solution USP, 3%. We were told to give them 2 times a day for 7 days. The oral one is Metacam, 1.5mg/ml and we were told to give 0.15cc every 24 hrs for 5 days. We've been treating him for 2 days now. What are the two antibiotics? The ofloxacin will treat a bacterial infection of the eye, but not a fungal infection around the eye. The Metacam is the anti-inflammatory med. Was this an exotic vet? I was under the impression those two medicines were antibiotics. It was a vet that treats all animals, including exotic pets. The image didn't show up. Most small animal vets have no experience treating exotic pets. There are plenty of exotic vets in New Jersey. If you go the clinic website and look at the staff biographies, you can find whether any of them have any qualifications for treating exotics. But if nothing has improved in two days, and it has spread to the other eye, I would assume that it's NOT a bacterial infection and that the eye ointment you were given isn't doing anything to help. If you hold down where it says image it'll come up to open it or on a computer right click! It didn't really spread though, it was just on both sides. I will definitely look into other vets! We kinda just went to that one because it was late Saturday and they were the only place open, yaknow? I don't want to continue to go anywhere that isn't going to give him the best care with the most knowledge though either. Is there anything else you would suggest doing? I'd treat it like a fungus. You really need some ophthalmic antifungal ointment, which you can probably only get from a vet. You really don't want to use an antifungal intended for the skin anywhere close to a pig's eye, since they wipe their eyes with their paws when grooming themselves. Thank you for your advice! I will be calling the vet tomorrow to try to get that or seeing if we have to go in again. Also thank you for attaching the pictures. You could treat him for mites. It's an unusual place for them to be, but mites can cause that kind of insistent scratching and hair loss. Just popping by to say it looks very much like ringworm to me. My pigs have certainly had it around their eyes as in your photo. 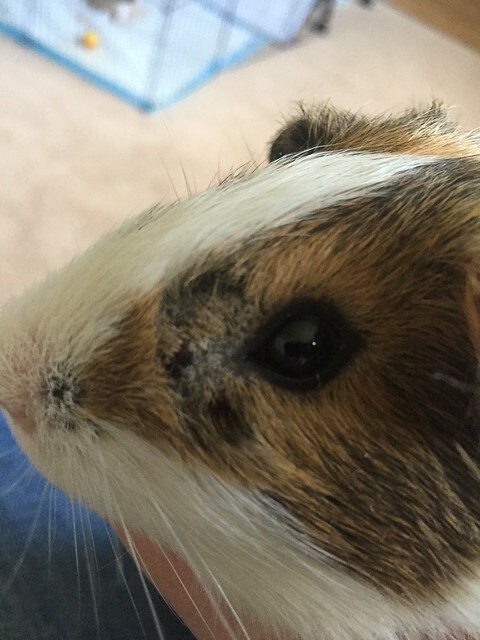 We've had a ton of ringworm trouble, and it often did not have the ring-shaped pattern. Google ringworm and click on Images -- you'll see the classic ring pattern. But ringworm is a fungus, like many of the other fungi that affect the skin, and the same treatments will work on either one. The organism that causes it is related to ones that cause jock itch and athlete's foot. The vet looked at a sample under a microscope and said it is not mites. Mites are very easily missed. I would never rule them out. However, as noted earlier, it does look fungal. Mites and fungus can be concurrent problems though. My guinea pigs have never had ringworm (knock on wood), but we just adopted 2 kittens that had it. We gave baths (not sure that would help in your case since its in the ear and around the eyes) twice a week; used an oral medication called Itrafungol (again, not sure its suitable for guinea pigs, but I know there are oral meds for guinea pigs that treat ringworm); and I used Monostat cream in VERY small amounts and rubbed it in good where the ringworm was on the face - above the eyes and on top of the nose. Like I said though, use a q-tip and extremely small amounts of the Monostat, at least in the ear. I'm not sure if it's safe around the eyes. Someone else more experienced can comment on that. Remember, ringworm is extremely contagious and you and your family can catch it or spread it to the rest of any animals you might have. Wash your hands with soap and water each time you handle them, and wear one special shirt for when you handle the piggies. I use a very large t-shirt and keep it away from everything. My vet told me its a very frustrating disease because it's hard to get rid of. Of course, we found out the kittens had it 2 days after they'd had the run of most of the house. Everything has/had to be disinfected.